One of the things that interests me for my own historical fiction is incorporating the more unusual snippets of facts that are known of real figures from the history of the period. For example, Jean Bernadotte who rose from fire-breathing revolutionary, joining the army as a private, to become Marshal of the Empire and then King of Sweden had a tattoo on his arm that read “Death to kings”…. It would prove embarrassing later in life! Or André Masséna who took campaigning with him in Spain his latest mistress, an eighteen year old ballet dancer from the Paris Opera, for whom he had especially fetching hussar uniforms made. 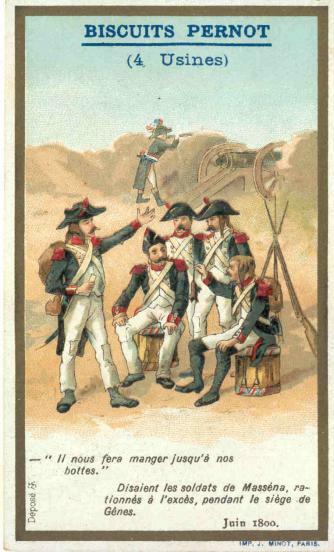 Or this one which I will definitely be using, relating to my favourite of Napoleon’s Marshals, Jean Lannes (above left). He was a no nonsense fighting general, always leading from the front, brave to the point of recklessness and with a temper that could raise blisters on granite. From poor working class stock in Gascony his education was rough and ready and his language choice at best; the language of the barrack room rather than the ballroom, and certainly not of the intellectual salons of Paris. 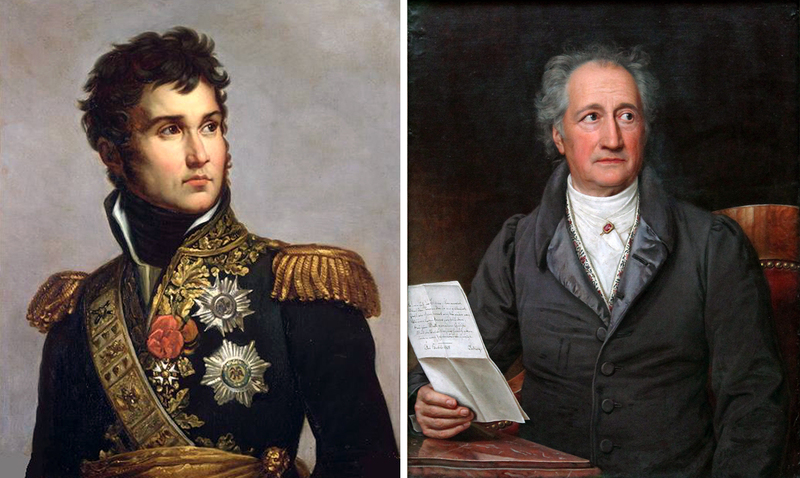 Yet, after the French victory at Jena in 1806, when French troops poured into the city of Weimar, chasing the retreating Prussian army it was none other than our Lannes who came to the aide of the poet Goethe (above right) who lived in the city. Fearful that the rampaging troops would destroy his library he sought protection from the French commanders in the city. None of them paid him any attention until Lannes heard of it whereupon he stationed guards around Goethe’s house to prevent it being pillaged. The writer invited Lannes to dine with him as a token of thanks and perhaps the attraction of opposites somehow came into play because the two thereafter became friends. I can only imagine that their conversation must have been really quite strange.